From The Necropolis Railway via Murder at Deviation Junction, Captain James Stringer is back on track in Andrew Martin’s eighth novel in this series. In 2011, Martin won the CWA Ellis Peters Historical Crime Award for The Somme Station, the seventh Jim Stringer crime thriller, after two earlier volumes had been shortlisted for the same prize. There are some die-hard fans out there, or ‘railwayacs’ as Stringer describes devotees of the steam engine. Stringer started his career as a plain-clothes detective on the railway force in York. 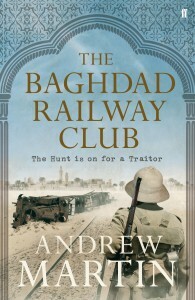 But in this new adventure, after being invalided out of The Western Front, Martin’s hero is packed off to Baghdad to investigate a possible case of treason. The author keeps up a good head of steam, and introduces an intriguing primary suspect, Lieutenant Colonel Shepherd, who presides over a dining society called The Baghdad Railway Club. This is a Boys’ Own world. One woman, the mysterious Miss Harriet Bailey, puts in the occasional but significant appearance. There are some entertaining secret codes like ANCHOVY, which stands for ‘Move immediately to arrest and detention of subject’. Throw into the schedule a couple of murders, and the plot is on the move, although halted for a while in a siding with a lecture by Stringer on the queerest thing that ever happened – ‘the affair of the already clipped tickets’. In this hot, sticky Mesopotamian summer of 1917, Sunni and Shia may be at odds, the occupying Turks may be dastardly, but the pace of Andrew Martin’s novel never exactly hots up. Nevertheless, for season ticket holders who are happy to stick to the timetable, this will be an agreeable journey, with a reliable driver, who knows the route, and will deliver his readers safely to their destination.